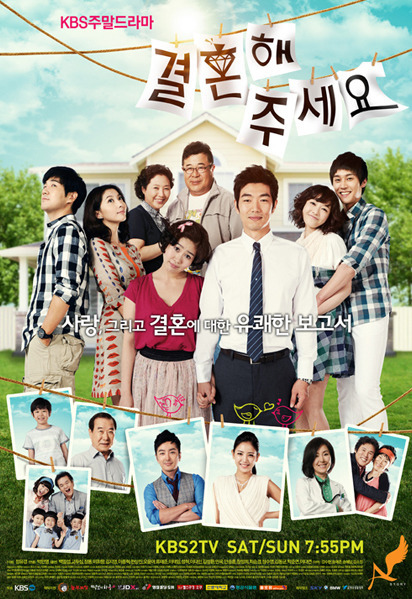 "All About Marriage" centers around four couples who live under the same roof. This drama will depict this generation's love, marriage, and divorce in a bright and simple way. "All About Marriage" takes over KBS2's Saturday & Sunday 19:55 time slot previously occupied by "Three Brothers" and followed by "My Love, My Family" on january 1, 2011. Proboomay Jan 24 2016 2:42 pm Love this show! It was my first kdrama. Whenever I start a kdrama that I can't get into, I always go back to this one. If you love k dramas, you should definitely give this one a shot; if you don't you are doing yourself a disservice. acjn Jan 17 2011 5:54 pm I like the show. When there is nothing on regular TV, I always go to the other channels with subtitles, or the Spanish channels. This show has clear, easy to read English subititles. Good story line. I always forget which asian channel it's on and what day. I think they recorded the final episode, but not sure if it's been broadcast on TV yet. acjn Jan 17 2011 5:51 pm I like the show. Especially with the clear subtitles in english. I went to the website for the KBS and you have to register with them, then, in order to be able to view any of the episodes online, you have to purchase "points". $10 minimum for 10 points. To watch one episide is 10 points. There is no way to unsubscribe to their service. charla molina Jan 02 2011 2:32 pm if any info is available would love hearing from you. thank you happy new year. charla molina Jan 02 2011 2:31 pm hi im looking for the song nam jung lim sings in all about marriage,anyone know where I can find it? also sound track from suk scandal. Mase Nov 16 2010 6:41 am Anyone know what Yun SeoYeong Name is???? ?